I’ve always loved tomato soup. I remember eating it by the bowlful as a kid along with my grilled cheese. Such an American classic combination, isn’t it? This season, Panera Bread is making a “grown up” grilled cheese on some kind of artisan bread with 2 different types of cheese, sliced apple, and smoked bacon. Sounds great, doesn’t it? I haven’t tried it but I did try their creamy tomato soup. Amazing! Of course, after I tried it, I came home and tried to find a Panera Creamy tomato soup recipe. I did find something that claimed to be from their cookbook, but the photos looked too orange to be the same version. My version is quite similar but it does not use flour or bay leaf, and it uses much less dairy. I’ve made it twice in the past week. It makes a fairly healthy lunch and it’s a good way to get more fruits and vegetables into your diet (tomato is a fruit, no?). I like to slow cook the tomatoes to bring out their natural sweetness. If you’d like to make your own croutons, use Italian or French bread and cut into cubes. Melt a bit of butter in a saute pan, and toss the bread cubes to coat. If desired, sprinkle on some grated cheese of your choice, salt, and pepper to add even more flavor. Cook over low heat until browned on all sides. In a large saute pan, melt butter and olive oil over medium heat. This soup was fantastic! 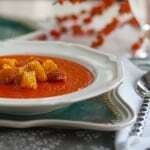 I was looking for a copycat Panera tomato soup and this is it! and it is much healthier. I have tried two other copycat recipes and this one is much better. I used 10% cream for the cream as it was all I had and it worked well. Thank you! Looks yummy!! I got to panera for lunch almost everyday and get it with the grilled cheese! I always get 2 bowls to go! If i keep doing that i think they might cut me off! Lol! Just made this soup! It’s AMAZING! It’s soup weather for sure! Glad u liked it. Oh! This soup is delicious. I’m making it for the second time. We just love it! Thanks, Melanie! We love it too! YES! I have been spending crazy amounts of money getting quarts of this soup to go from Panera and this tastes just like it! I roasted my garlic first and used about 4 roasted cloves. Then I used 1 28oz can whole marzano tomatoes, 1 pint fresh tomatoes, and 2 cups of frozen diced romas. Thanks for sharing!! Thanks, Jessica! I’m so glad that you enjoyed it. Your additions sound great – I love to hear how people tweak recipes to their liking. That looks totally deliciously creamy! It is really good – hope you try it. if you do, make sure you use high-quality tomatoes. Makes a big difference. This looks fabulous! Your photography is amazing! Thanks, Isabel:) I’m having fun with the photography – so much to learn!